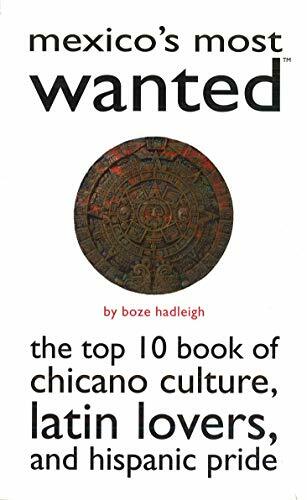 [PDF] Mexico's Most Wanted: The Top 10 Book of Chicano Culture, Latin Lovers, and Hispanic Pride | Free eBooks Download - EBOOKEE! Description: Hispanics are now the largest minority in the United States. Of the more than forty million Hispanics, some two-thirds are Mexican or Mexican-American. Almost half of all babies in the nation are born of Hispanic parents, and "Garcia" is quickly becoming the most common surname in America. So there's no better time to feast on the interesting and entertaining trivia provided in "Mexico's Most Wanted! ".Author Boze Hadleigh, grandson of a Mexican general and diplomat, covers Mexico's culture and history in all its wonder. He discusses the fabulous food and drink native to Mexico details its star actors, actresses, directors, singers, and athletes highlights the history, ruins, and vacation spots that make Mexico a premier destination for travelers and so much more.Mexico's diversity and cultural and historical achievements are barely known to most Americans or even to many Mexican-Americans. Mexico has a long, rich, and fascinating heritage to be proud of, celebrated, learned about, and visited. 2011-10-25Graziano Kratli, "The Trans-Saharan Book Trade: Manuscript culture, Arabic literacy and intellectual history in Muslim Africa"
No comments for "[PDF] Mexico's Most Wanted: The Top 10 Book of Chicano Culture, Latin Lovers, and Hispanic Pride".